Don’t you just love watching a gently flowing stream? Or sitting by the sea watching the sun go down? Or simply relaxing by an aquarium with tropical fish? If only all those ways to relax were possible in everyday life! But actually, they are thanks to amazing 4K relaxation videos from Uscenes. Videos from Uscenes are beautifully done screensavers for your smart TV or any other device. All of them are filmed on location so that you get real sounds when you’re watching them. The fact that they are filmed in 4K makes the videos even more realistic – just perfect for watching on your TV when you’re tired and want to relax. What Sort of Scenes Are Available? Well, you name it! Uscenes seems to have it all, from tropical beaches to crackling log fire and beautiful aquariums. There are videos to suit anyone whether you’re a city lover or a wildlife enthusiast. Typically, the videos from Uscenes last around twenty minutes. That’s enough to make them interesting to watch and not too long. If you want to watch more, you can always loop them or download the longer versions. 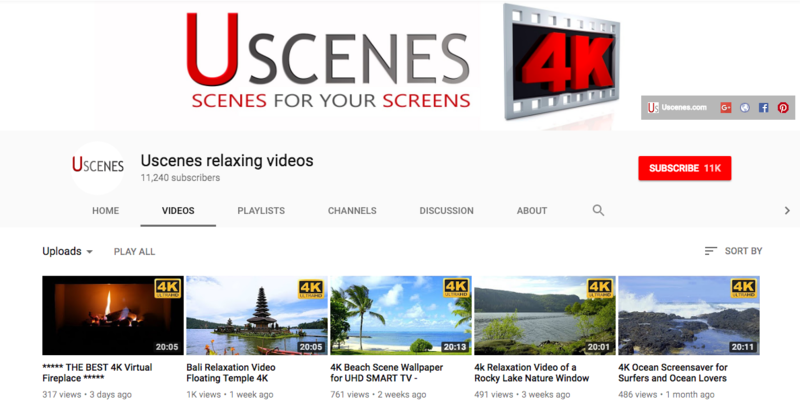 Simply go to YouTube and subscribe to Uscenes channel. Believe me, it’s worth it especially if you need something to help you relax.